This is my entry for this month's All That Flutters Challenge at Swirlydoos. I do believe the title says it all - "Bellissima" perfectly describes my granddaughter. Her mom caught her on the way to the car with a bottle of water in her hand and a pair of sunglasses perched atop her head. 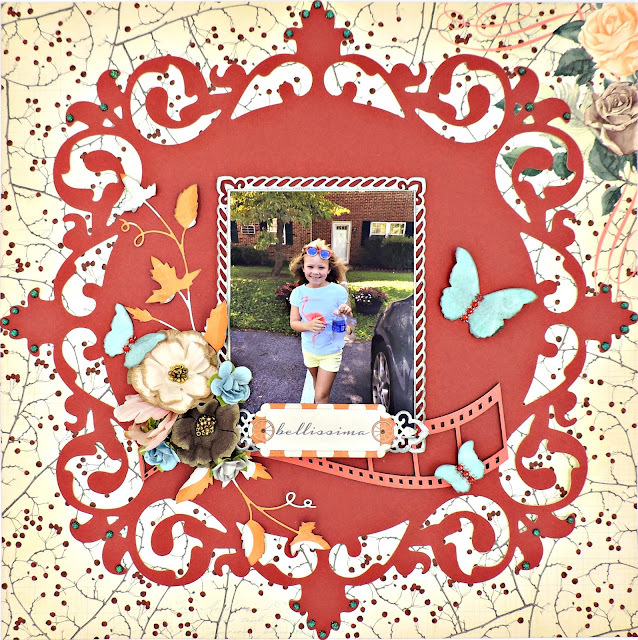 The latest kit from Swirlydoos - Creamsicle, featuring Bo Bunny's Bella Rosa collection - is full of end-of-summer colors and fun elements - perfect for scrapping the photos taken during the past few months. I decided to use the Anna Griffin die cut included in the kit to tone down the busyness of my base paper; as pretty as it is, I needed something a bit more solid behind my photo. I colored my chipboard piece (Wavy Cut Filmstrip by Creative Embellishments) with Ranger's Vintaj Patina in Coral. While that was drying, I selected several dies and cut out some embellishments using scraps from my previous layouts. The photo "frame" and the piece under the title were made with Spellbinder's Card Creator A2 Valiant Honor die. Several Memory Box dies were used to create the butterflies (Butterfly Swarm) and the vines (Grape Vine). The Prima Vintage Emporium flowers are from my Swirly kit; the other blooms are from my stash. Also from the kit are the butterfly centers, cut from the Darice Bling on a Roll and the faux gems on the edges of the die cut. A bit more bling can be found around the edges of my die cut - faux rhinestones made with Tonic Studios' Nuvo Crystal Drops in Aquatic Mist.